Elite players devote significant time to throwing practice. Beyond volume, there are differences in the quality of how experts practice versus novices or even intermediate throwers. You can see differences in how experts practice across all kinds of motor skills, from playing the cello to serving a tennis ball. Elite performance is unlocked by spending significant time in difficult, deliberate practice. Deliberate practice occurs outside of your comfort zone. It is riddled with mistakes. According to K. Anders Ericsson, whose research contributed to the often-quoted rule that 10,000 hours can make anyone an expert at a given skill, elite performers use regular and brief, but intense periods of practice on their own. Performers on the tier below the elite may practice just as often, or even more. But it is the quality of practice that is vital to getting the most benefit from your practice time. What follows are some guidelines and steps to help you in your solo, deliberate practice. Approach your practice with curiosity and a detachment to the outcome. In deliberate practice you want to explore what is happening with the skill you’re focused on. Notice that this frame of mind is the opposite of judging what you think should be happening. I know that achieving this frame of mind is easier said than done. An excellent resource for more information about why this mindset is necessary and how to foster it is The Inner Game of Tennis by W. Timothy Gallwey. Where are you directing your attention? Is it a type of throw? Being specific means you’re not working on your forehand, but on your “inside-out forehand.” Not “backhand” but “low-release backhand.” Maybe you do want to work on all of your throws but the focus is on hitting the receiver in the hands while on the move. Or hitting a receiver on the break side while facing an active mark. The more specific you are with your attention and intention, the more you can take control of your pace of learning. What do you need in order to make the most of your practice? Is it helpful to watch some video examples before you leave the house? Or have them loaded on your phone? Do you need a tripod to record your throws? Do you need an extra throwing partner to set up a mark? A few minutes thinking about these things in advance can go a long way to making sure you get the most out of your practice time. Finding the right throwing partner can be a real challenge. I’ve described deliberate practice as a solo activity and that doesn’t change much if you have someone acting as a target. It is not a social activity. When I am really practicing with another person, there is very little talking going on, just a lot of throwing. If you are in the role of helping others with their throws it can be difficult to find someone who will let you ignore them to focus on your own stuff. As more people learn how to practice, they will become better at self evaluation and thus make for better targets! There are four steps that make up the system of deliberate practice in order to produce tangible results in motor skills learning. Be specific. If you are throwing an outside-in forehand, what kind of trajectory are you trying to achieve? A little bit of inside-out to counter the potential wind direction? Enough to get around a defender? A blade? Know what it is you’re trying to throw before you throw it. Also, where is your receiver supposed to receive it? Are you throwing to the right hand, the chest, or above the head? Once you have a specific outcome in mind, stop thinking and throw. Let your body do the thinking for you. Simply try to produce the desired result with your intended technique. After the throw, engage your brain again. What did your body just do? How closely did the trajectory and catch line up with what you visualized? How did the disc feel coming off your fingers? Did you flick your wrist the way you wanted to? Was the angle of the disc at the point of release what you intended? Slow-motion video will help you to see and evaluate errors in technique. Coaches Eye is a free app you can use to at least get some immediate slow motion replays. Often what we think our body is doing is very different to what is actually happening! If you didn’t execute your intended form or technique, experiment with coaching cues to help you get the desired result. Analogies work well for motor skills learning, as do words that encompass many things at once. The word or coaching cue is something you can repeat to yourself in your next repetition. Words can be simple like “fast,” “smooth,” “tight,’ “in,” or “wide,” depending on what you are trying to change. These words can also help you during performance as focusing on one word can force out extraneous and unhelpful thoughts. Coaching cues coax and invite your body to try a different way of moving without taking conscious control of the exact movement patterns. Keeping conscious control out of your movement is important because movement isn’t a cerebral (thought-intensive) act, and so is handled by different parts of your brain. Now repeat this process in every repetition. Simple! Just not easy… Here are a few tips on how to use the above process effectively. Understand your limits and learn to recognize when you are done. Deliberate practice is hard. Though it is absorbing, it is often not fun. Even the most elite athletes and the very best classical musicians are capable of putting in only five hours of deliberate practice a day. It is mentally tiring stuff. But it should also feel a bit like meditation. When your mind is fully engaged, you don’t notice the time passing and you don’t feel emotions about what you’re doing. You’re “in the zone.” If you’re feeling frustrated, you’re not being objective in your evaluations of each throw. Maybe that’s when it’s time to stop for the day. If you can put in a few well-focused hours per week, you should feel very good about that. Focus is a limited resource. You can also think of attention and focus like muscles that can be trained. Engaging in deliberate practice over time is an important part of mental strength training. Maybe you can only maintain solid focus for 20 minutes when you start your deliberate practice journey. You can practice bringing your focus back to where you want it every time your attention wanes. Though it may be frustrating, know that your mental toughness and ability to focus will improve along with your throws. Elite performers spend a lot of hours in solo practice. However, they don’t become elite performers on their own. Teachers and coaches play an enormous role in the quality of practice of their students or athletes. The role of the coach changes over time depending on the skill of the performer they’re coaching. For novices, the coach will provide frequent and specific feedback. But deliberate practice only works when the performer can evaluate their efforts themselves. Still, even when the performer is able to do effective, solo practice, the coach’s work is not done. Deliberate practice requires focus on very specific aspects of form in developing motor skills. An athlete or musician needs a more experienced mentor or coach to guide practice by having an in-depth understanding of the motor skill that’s being acquired. Experienced coaches know how to assign practice tasks that land right in the sweet spot just outside the comfort zone of the athlete. Deliberate practice isn’t easy or all that enjoyable. Only the most committed will find that they want to dedicate the time to unsociable training outside of their team environment. Many throwing partners will have to be cast aside for being too chatty. But it’s this mentality that separates elite athletes from the chasing pack. 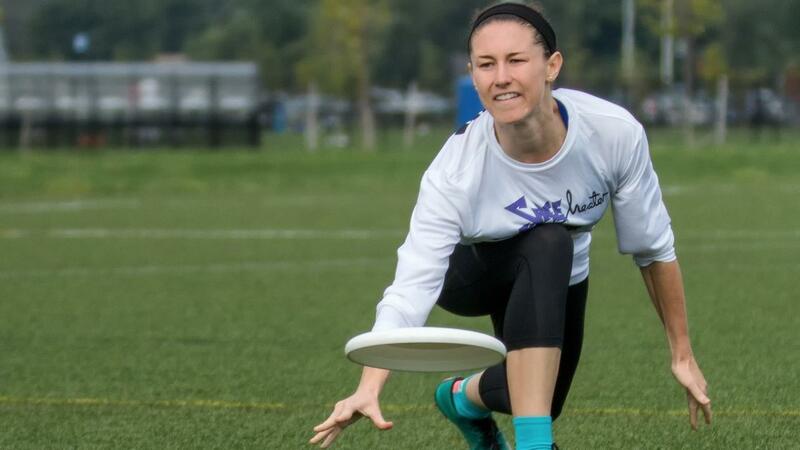 If you are wondering what to practice aside from throwing, check out The Ultimate Skills Project where we asked elite ultimate players and coaches to break down fundamental ultimate skills to specific detail. In The Ultimate Skills Project you can find drills to help you deliberately practice defensive footwork, marking, throwing and other ultimate skills. Check out ten examples of what you’ll learn in The Ultimate Skills Project here. Since we know that deliberate practice combined with outstanding coaching creates elite performance, we’re working on a special project for a small number of committed players. This program will give you access to our network of elite players and coaches so that you get the specific feedback and coaching you really need. You’ll be able to consult 1-on-1 with international ultimate champions, mental toughness coaches, nutritionists, biomechanics experts, and so much more. If you have a burning desire to be the best ultimate players you can be, sign up here. We’ll tell you more about the project and you’ll be first in line when we open next week! Photo by Ultiphotos photographer, Ken Forman.